This is only one of many reasons why I like to hunt deer. Eating them. Freezer meat is where it’s at. I hope we have a great fall hunt this year. Today’s supper menu includes some small steaks that will be quick grilled on a hot fire. These pieces come from what we call the “football roast” in the ham. I take that roast and trim it, muscle it out and then slice it about 1/2 to 3/4 of an inch. These are marinating in the fridge with Dale’s Seasoning. You don’t need a lot. In fact, I dilute it a little with water. I’ll add a dry rub right before grilling and any good steak rub will do. With a side salad you just can’t beat this for GOOD. I have cooked venison like this for lots of people and unless I tell them they don’t know they’re not eating beef. Of course I like and cook beef too! Just thought I’d share with my foodie peeps. 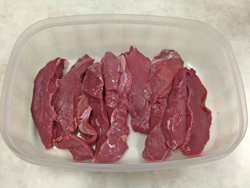 What’s your favorite way to cook venison?